Zookeeper Lavender Jones, aka Snake, and her husband, Jeff, an Aussie herpetologist who bears a striking resemblance to the late crocodile hunter Steve Irwin, investigate a murder in which the zoo’s star crocodile is chief suspect. Anthony Wright, director of the Minnesota Valley Zoo, is no one’s favorite. Still, finding him dead in the crocodile pool on the night the zoo’s Australian exhibit officially opens is a bit of a shocker. Even more shocking is the arrest of the crocodile keeper, JR, who the police discover is wanted for murder in Florida. Snake can’t believe JR is guilty even after her sleuthing turns up the details of his alleged crime, which involves several other members of the zoo family: Wright’s wealthy wife, a State Senator and JR’s ditzy girlfriend, on the run from an abusive husband. When Snake barely escapes with her limbs intact after she’s kicked into the crocodile pool, she’s sure her hit-and-miss detection has hit a nerve. Gary Olson, intern on Jeff’s wildly successful cable wildlife show, Zoofari, adds to the confusion when he shows Snake evidence that Wright may have been involved with the lucrative illegal trade in wild animals. Snake must dig deep to prove to her high-school boyfriend, now the cop in charge of the case, that JR is innocent. 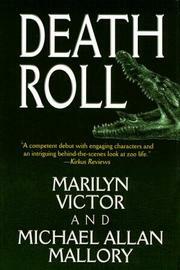 A competent debut with engaging characters and an intriguing behind-the-scenes look at zoo life.